> The theatre industry always seems to want to box you in. Theatres seem to get suspicious if you talk about yourself as a professional with different specialisms. > All the industries we work in would be so much better, more innovative and more humane if everyone was more honest and open about processes, including where no-one knows anything, and about what was at stake not just financially, but also artistically and emotionally. > Oblique Strategies are always helpful. > Critical peers who listen and who you trust, and good spaces to work in are invaluable. Thinking about honesty in particular, brought to mind a (pretty personal) article I wrote for the Bristol Old Vic blog back in January this year, about my Leverhulme Scholarship experience so far, and how transformative it’s been for me. 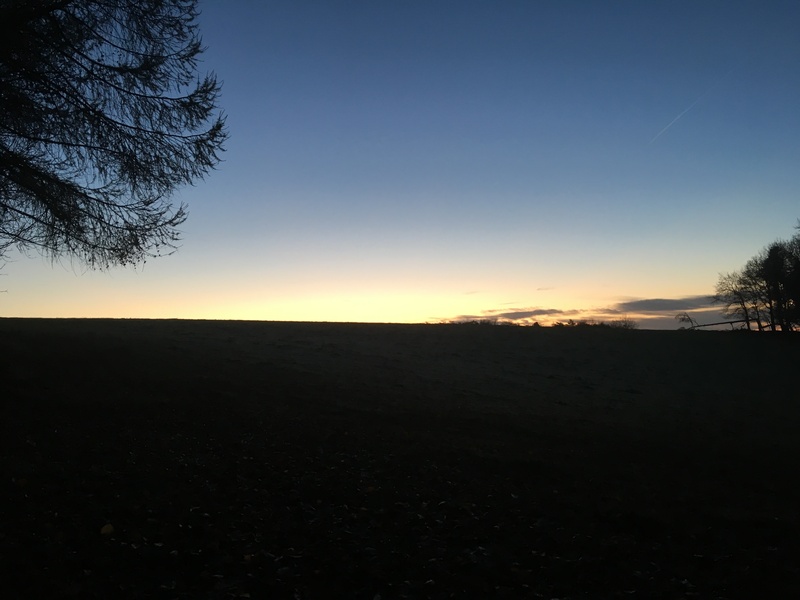 Back in mid-November, I was on a totally lush Hawkwood College Artist Residency as part of my Leverhulme Scholarship with Ferment at Bristol Old Vic (BOV). I was asked to write a few words for Team Ferment about it, but never got round to it due to a) various busy and b) an itch at the back of my mind that I’d like to do some deeper reflection on the scholarship so far and where it’s taken me – because it’s been utterly transformative for how I understand my perspective and skills as a theatre director (thumbs up!) but the journey has been waaaaay different to what I’d planned or anticipated (thumbs up!). I came into the Leverhulme scholarship at a point of deep professional frustration. The scholarship has been brilliant for letting me let it out, and then helping me work out what I can do about it and how I can do that on my own terms. The time – and the money to spend the time – has been crucial to that, as has the stamp of affirmation that comes from being awarded the scholarship. But really, the MOST important thing has been the regular, thoughtful interrogation I’m getting from the brilliant Emma Bettridge (BOV Ferment Producer). I’m lucky to be working a lot, but it means I don’t prioritise time to deal with the hard stuff that will open up new opportunities for me as a director. Right at the start of the process I asked Emma to keep pushing me out of my comfort zone, and she’s been brilliant at reminding me to keep chipping away at the hard stuff. She’s been genius at helping me start building that chipping away into my ongoing practice as a director. Or more succinctly: I’d like to use this opportunity to make myself more employable as a director please. It’s strange looking back at this application now, many months into the scholarship, because it reveals how unconfident I was about my skills and ability; how insignificant I felt my experience was; and how much I thought it was all about me needing to change, rather than the industry. It reeks of me seeking validation from the establishment. In May, I wrote and published this article, as a way of working through some deep-seated, inhibiting frustrations I had about being too “diverse” to be mainstream, yet not authentic enough to bring a “diverse perspective” in the eyes of producers. In July, I heard a brilliant talk by Dr Sarah Atkinson about how women have been written out of history, which included a plea for more women to go for opportunities even when they don’t feel fully qualified (in a way that men have less of a problem with). And in August I had a brief session with super-successful (and also not formally trained) War Horse etc director, Tom Morris, looking at AREAS OF BASIC THEATRECRAFTZ (AOBTz), which a) reminded me that professional experience trumps formal training and b) surprised me by revealing that I already understand and regularly employ AOBTz in my theatre directing – I just also tend to stretch it beyond its conventional purpose, and mix it up with techniques from other forms. This quiet revelation about AOBTz has been crucial for me. Not only did that session give me confidence in my basic foundations, but it was also great to realise that I regularly apply technical craft from other forms (e.g. live art, dance, film) that are either not considered part of a director’s toolkit or dismissed as ‘uncrafted’ by the theatre mainstream. In my first few weeks of Music GCSE, my teacher marked down one of my compositions for its reliance on perfect fourths and fifths. “But it sounds good,” I insisted. So I quit Music GCSE. I kept playing music and composing, but I was a bolshy teenager and I was in no way going to formally buy into the notion that the theory of music was more important than the experience of music. I guess it’s the same for me with theatre – though more mature me is more conscious of wanting to understand the craft in order to manipulate it more powerfully. There are always going to be people who judge me as doing the theatre craft badly, when actually I’m consciously trying to give the audience a more surprising – and hopefully more remarkable – way into the story and the experience. Ultimately, it all comes down to desire, and taste. So since October, I’ve been focussed on how I might address that invisibility. If you’ll allow me to talk frankly here, the fact is that the UK theatre industry is deeply conservative in how it functions, very concerned with peer judgment, and has black hole levels of London-centricity. I mean, I get it. We work with an ephemeral artform. You can’t just pick up a DVD of someone’s production and get up to speed with their work – we need other anchor points to help us get to know who’s out there. The problem is that these anchor points – certainly in the field of script-led theatre – are skewed enormously towards traditional training routes, LONDON, those who work for theatres rather than self-produce, and LONDON. You might see all the new work in your local town, but you probably also go to London. You don’t necessarily also go to Manchester, or Newcastle, or Bristol as a matter of course. Especially if you’re a theatre critic. All of this is compounded by the feedback loop of current theatre criticism. In the grand game of theatre industry top trumps, I have rubbish scores in all those areas. I’ve got an impressive CV of experience to point to, but no-one’s looking, because I’ve got crap scores in those boxes. I don’t have those privileges so I’m going to have to find other ways to get people to see me. There’s stuff I need to practise, actual practical work I need to do, in order to improve my visibility as a director and that’s what I’ve been getting my head down to over the last few months. I’ve got to get better at articulating my practice and why people should be interested. I’ve got to get better at pitching my approach to plays. I’ve got to get out and meet more people who live in venues (artistic directors, literary producers etc). I probably need to get an agent. I’ve got to come to terms with being on repeat about the fact that despite not living in London, I’m up for working on plays in your theatre. One of the great things about Bristol – and one of the main reasons why I choose to live here – is the clever, confident and ambitious artist community I get to play and think things through with. I’m not the only Bristol-based director experiencing this frustration and I’m working with allies to challenge our local producing theatres not to overlook Bristol-based directors for their productions. I love that this scholarship is helping me work with my peers to change opportunities for more than just me. Last week, me and my fellow scholars gave a little talk about our experiences so far on the scholarship. We’ve all done different things, but we all talked about the incredible value in being able to genuinely learn as we went, rather than having to deliver prescribed outcomes. I’ve been able to rewire the machinery of my practice and map career routes I never thought I’d be able to take, without having to deny my artistic curiosity and background. There is NO WAY I’d have achieved this if I knew I was going to have to show some work-in-progress or pass an exam at the end of it – I’d have been way too focused on what I had to do, rather than actual learning. At the talk, Emma mentioned how hard it was to protect the non-outcome-focussed nature of these scholarships. I’ll talk to anyone who’ll hear me about why that needs protecting. I’m into the last few months of my scholarship now. There’s a lot of practical and intellectual graft, emotional steel and a shedload of train journeys that’ll need to go into pushing my visibility as a director. But as I said back in May 2017, right at the start of my scholarship: I need to get over it and make my story more visible. Because I’ve got a voice and a career in this business – and I want more different people to influence our culture not just at the margins, but all the way through. Thanks BOV Ferment for awarding me time, space, money and support to push towards this. I can’t think of anything else like these scholarships. Here’s to the next cohort. Hope you guys run with it.